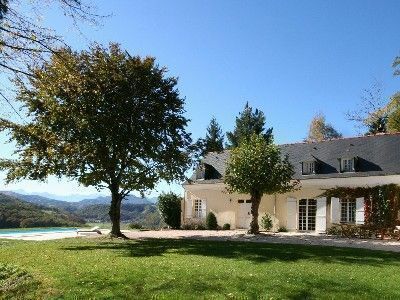 B&B and Gites offered at tranquil rural location in Pyrenean foothills, with knockout mountain views. Ideal base to explore region and its spa towns. 10 mns to Lourdes, 15mns to Bagneres-de-Bigorre. Many activities including cycling, walking & golf. Cami de Bidale is an elegantly restored country house Bed & Breakfast, characterised by high ceilings, oak beams and open fireplaces.Each room has an en-suite bath and/or shower room, including a washbasin and WC. Thermostatic shower taps, towel heaters and hairdryers are standard. Pocket sprung beds and good quality soft furnishings assure a restful night. Outside there is a heated swimming pool with beautiful mountain views. The house enjoys a magnificent rural setting, just 8km from Lourdes in the Hautes-Pyrenees department, within the Midi-Pyrenees region. Located just 8 km from Lourdes and 10 km from Bagneres-de-Bigorre.